As if Jeffrey Deitch being selected as the new director of MoCA wasn’t enough to grab your attention, Deitch Projects has just announced that Shepard Fairey will be the last artist to exhibit at the notorious SoHo gallery. The celebrated street artist, graphic designer and illustrator – known by some for his anti-establishment brand, OBEY, and others for his ubiquitous portrait of Obama – will be showing his new work on the east coast a month before Deitch takes the reigns in Fairey’s hometown of Los Angeles. According to Fairey, the focus of the show be on “trailblazers in areas of art and culture who I care about,” from cultural icons such as Patti Smith and Woodie Guthrie to academics like Cornel West and spiritual and political leaders including the Dali Lama and Aung San Suu Kyi. 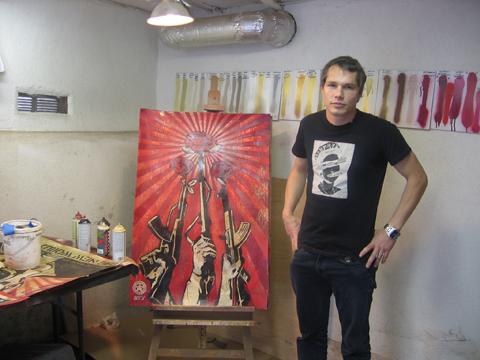 Catch Shepard Fairey’s show at the Wooster street space starting May 1, 2010.